Originally, sausage-making was a way to preserve meat trimmings left over on the butchers' table. Salt and other spices were added to help extend the shelf life. Sausage is cured either by drying, smoking (hot or cold), or salting. As techniques improved people found sausage to be not only a cheap and easy food but a delicious one. Sausage is generally made from pork, but also from beef, veal, lamb, chicken, turkey, and game. In recent times, the quest for lower fat foods has driven many people to chicken and turkey sausage and the quality of these types of sausage has improved a lot. Cold smoking occurs at 70 to 90 F and can take up to a week. Hot smoking is done anywhere between 100 and 190 F. If you are interested in making your own sausage, start with the hot smoke method. The cold method can be dangerous if you aren't careful. Hot smoking is done just like you would barbecue a brisket. Heat up your smoker once you have your sausage prepared and place in smoker. Use a mild wood and smoke at a low temperature. To eliminate any chance of food poisoning you need to bring the internal temperature to 160 F. However, you can take a middle ground. Smoke the sausage partially at a low temperature to add a smoky flavor and then remove it from the smoker before they start to shrink and dry. Then when you are ready to serve them, cook to 165 F.
Andouille Sausage: A spicy, heavily smoked sausage made from pork chitterlings and tripe. French in origin, Andouille is a specialty of Cajun cooking. It's used in specialties like ​jambalaya and gumbo. Andouille is also especially good served cold as an hors-d'oeuvre. Bauerwurst: A coarse-textured German sausage that is smoked and highly seasoned. It's usually steamed or sautéed. Bierwurst or Beerwurst: (Does not contain Beer) A German cooked sausage made with lots of garlic and is a dark red color. It's usually sold as sandwich meat. Blood Sausage or Blood Pudding or Black Pudding: A large link sausage is made of pig's blood, suet, bread crumbs and oatmeal. Almost black in color, blood sausage is generally sold precooked. It's traditionally sautéed and served with mashed potatoes. Bockwurst: Flavored with chopped parsley and chives, this ground veal sausage is of German origin. It's generally sold raw and must be well cooked before serving. Bratwurst: A German sausage made of pork and veal seasoned with a variety of spices including ginger, nutmeg, and coriander or caraway. Though it is now available precooked, bratwurst is generally found fresh and must be well grilled or sautéed before eating. Chorizo: A highly seasoned, coarsely ground pork sausage flavored with garlic, chili powder, and other spices. It's widely used in both Mexican and Spanish cookery. Mexican chorizo is made with fresh pork while the Spanish version uses smoked pork. Head Cheese: Not a cheese at all, but a sausage made from the meaty bits of the head of a calf or pig (sometimes a sheep or cow) that are seasoned, combined with a gelatinous meat broth and cooked in a mold. When cool, the sausage is unmolded and thinly sliced. It's usually eaten at room temperature. Italian Sausage: This favorite pizza topping is a coarse pork sausage, generally sold in plump links. Italian sausage is usually flavored with garlic and fennel seed or anise seed. It comes in two styles ­ hot (flavored with hot, red peppers) and sweet (without the added heat). It must be well cooked before serving and is suitable for frying, grilling or braising. 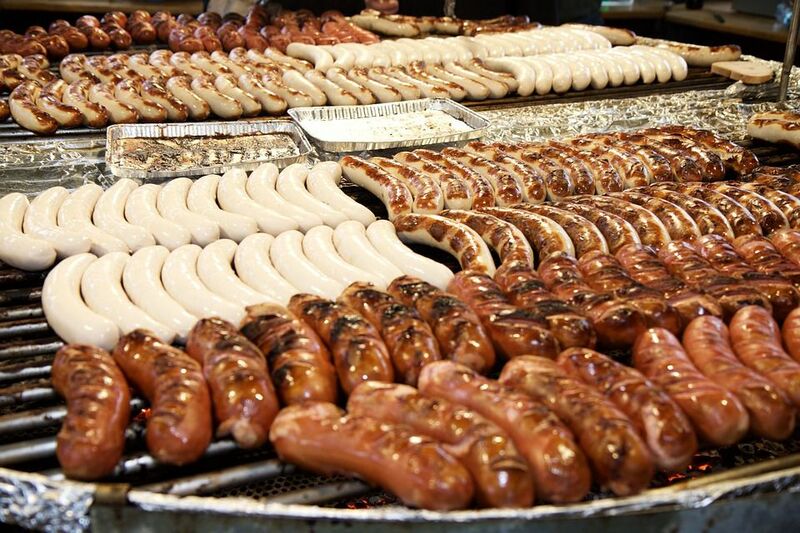 Kielbasa or Polish Sausage: This smoked sausage is usually made of pork though beef can also be added. It comes in chunky (about 2 inches in diameter) links and is usually sold pre-cooked, though an occasional butcher will sell it fresh. Kielbasa can be served separately or cut into pieces as part of a dish. Even the precooked Kielbasa tastes better when heated. This is my favorite in a bun. Loukanika Sausage: Seasoned with orange rind, this Greek sausage is made with both lamb and pork. Loukanika is a fresh sausage and must, therefore, be cooked before eating. It's usually cut into chunks and sautéed. Weisswurst: German for "white sausage," weisswurst is a delicate sausage made with veal, cream, and eggs. It's traditionally served during Oktoberfest with sweet mustard, rye bread, and beer. Remember a couple of things: many sausages are now available in an uncooked variety so you can take advantage of smoking them yourself. Don't try to smoke a smoked sausage unless you do it at a high temperature (225 F) and for a short period (1 to 2 hours). Do this to basically warm the sausage. If you are smoking uncooked sausage watch the internal temperature and make sure it gets to at least 160 F.